Pyrolysis involves heating biomass, such as agricultural waste, in an oxygen-free furnace to produce clean energy. Instead of emitting air pollutants, the process leaves behind a solid residue called biochar, which can be buried to “sequester” the carbon trapped during bioenergy production, thereby reducing greenhouse gas emissions. Scientific evidences are demonstrating that biochar as a pyrolysis by-product can be exploited for numerous uses in agriculture, construction, electronics, cosmetics, industry and many other sectors. However, the legal framework has not been updated yet to reflect the recent scientific developments and so biochar, a substance similar to charcoal, is still considered a waste to dispose. Through adoption of pyrolysis, an environmentally friendly technology producing heat, new opportunities to explore suitable solutions for environmental issues regarding CO2 emissions and waste disposal are opening. The pyrolysis can be easily fitted to different context conditions and the different biomass types in a number of regions not only throughout Central Europe and it is also suitable for managing environmental approaches in both rural and urban communities. E2BEBIS tackles the limited use of biochar in Central Europe, the lack of a proper legal framework on biochar on EU level, as well as on national levels in the participating countries, and the low awareness of the potential benefits of biochar among policy-makers and other stakeholders. 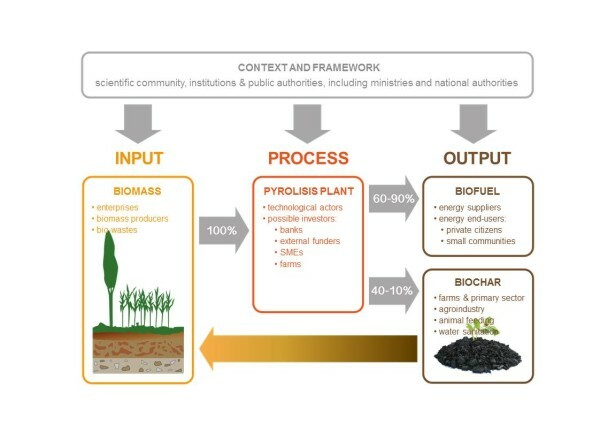 The project runs from June 2012 until November 2014 and consists of a series of activities targeted at all biochar-related stakeholders (eg. public authorities, scientific community, agriculture sector, energy suppliers and end users) and aimed at developing good practices related to biochar and influencing policy-makers on all levels. The project is financed by the EU’s Central Europe programme, a programme that fosters cooperation among the countries of Central Europe to improve innovation, accessibility and the environment, as well as to enhance the competitiveness and attractiveness of cities and regions in the area covered by the Programme and beyond.